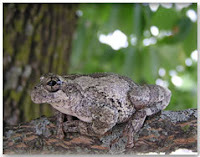 Long after its season of nighttime wooing has passed, the Eastern Gray Treefrog occasionally erupts in daytime song, but no one seems to know just why. These arboreal acrobats that can climb glass windows as well as trees can also deftly snag an insect in mid-air as it passes by a branch. They feed mostly at night and sleep by day. However, in late August, their brief, bird-like trills can occasionally be heard at almost any time of the day, especially if there’s been a shower. You might hear a call from one tree, then a response from another, and depending on how froggy your neighborhood is, two or three other treefrogs nearby may join in the exchange. In the spring, their calls are part of the expected nighttime chorus of courting critters, but by this time of year, all that love-making is long past. So why sing when they’re supposed to be asleep? Perhaps they suffer from somniloquy and are just sleep-talking as they dream of happy, youthful encounters those long months ago.